The Chinese smartphone market works in such a way that its insularity has caused the number of small vendors to surge over the past three years, all competing for the hundreds of millions of potential Chinese smartphone users. At the last count, the number had reached 80, most of which are no household names; only Lenovo, Xiaomi and Huawei have managed to cross that east-west chasm. Now, a newcomer, Doogee, aims to challenge the status quo with a raft of new smartphones. Put aside, the slightly err… dodgy name, this Chinese brand aims to wow businesses with a mixture of eye-catching design and rock-bottom price without the price tag associated with, say, a BlackBerry KEYOne. The model sent to us is the Aurora Blue; it is also available in Coral Blue and Dazzle Black color scheme with silver model is expected shortly. Doogee describes the process by which the smartphone gets its peculiar finish as one that uses a "micron scale vacuum ion plating technology." Mind-blowing to say the least. Various iterations of the Mix are available and the one sent to us had 6GB RAM and 64GB onboard storage; other combinations with 4GB memory and 128GB storage are also available. The Mix is unlike most smartphones you will have seen in high street stores in the UK. 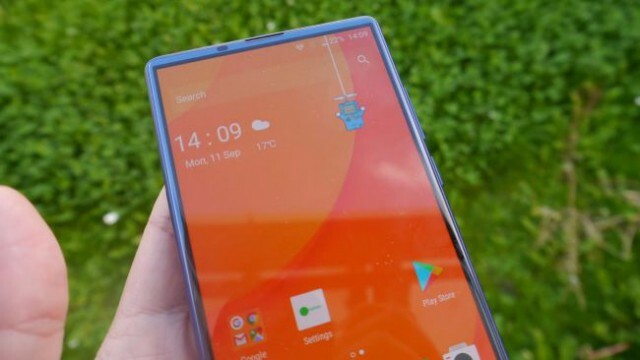 It derives its inspiration and its name from the Xiaomi Mi Mix with a super thin bezel (around 1mm) on three sides and the fingerprint reader from DTouch and the front facing camera crammed in the last one. That’s not as extreme as the iPhone X though, but it does manage to cram a 5.5-inch display screen in roughly the same body as a 5-inch display, achieving an exceptional screen to body ratio of 93 percent. Its dimensions -- 144mm x 76.2mm x 7.95mm for a weight of only 191g -- make it quite portable for a display of this size. Sadly the home button and the two other system buttons are located by default on the lower part of the display but can be hidden if wanted. You won’t find any notification LED which will put off some users but that might be an acceptable compromise for a better design. Doogee opted for a 2.5D curve effect which translates into a slab of glass and metal that can sits comfortably in your palm; just be careful about scratches though. You will find an earphone socket, a microUSB port, a speaker grill, the power button, the SIM card tray and a volume rocker. The Doogee Mix uses a Samsung Super AMOLED screen with a Corning Gorilla Glass 5 overlay and while the overall quality of the display is outstanding, it is hard to ignore the fact that it has only a resolution of 1,280 x 720 pixels, one of the rare occasions where corners have been cut to save on the bill of materials. Inside the chassis are an 8-core Mediatek Helio P25 system-on-a-chip clocked at up to 2.5GHz -- which supports the B20 band -- and paired with a Mali-T880 GPU. 6GB LPDDR4x and 64GB onboard storage. The internal memory can be upgraded via a microSD card, but at the expense of the dual-SIM functionality. The whole system is powered by a non-replaceable 3,380mAh battery, which can be charged using a 5V2A charger that takes only 30 minutes to fill the battery to the 80 percent mark. The phone uses Samsung ISOCELL camera sensors at the back, a 16-megapixel and an 8-megapixel pair with F/2.0 and PDAF technology to make the most out of tricky situations; it can only record full HD videos rather than 4K ones. The front one is a 5-megapixel model with a F/2.2 aperture and capable of covering a 86 degrees. As expected, the Doogee Mix runs on Android 7.0, albeit a customized version of it. Like most of the competition, the device supports two SIM cards (one Nano and one Micro) and when it comes to connectivity, you’re limited to Bluetooth 4.0 and 802.11n (no AC). We were surprised to find that there was an update waiting for us, which is a good sign. 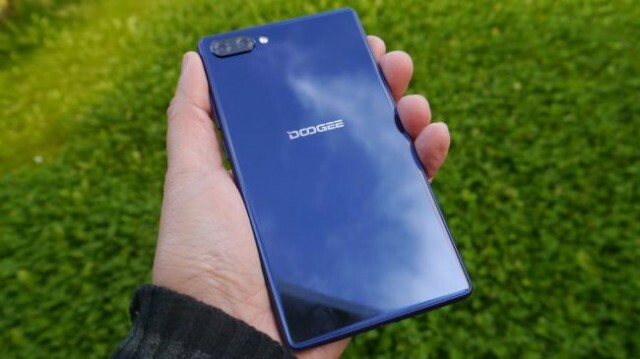 Chinese vendors are notoriously slow at pushing out updates but Doogee dodges that bullet. Unfortunately, the phone is a bit of a fingerprint magnet due to the material used but it won’t slide down a smooth surface like some of the competition because of the extruding camera sensors. We did not notice any lag when using the Doogee Mix thanks to the powerful processor, the low pixel count of the screen (which reduces strain on the GPU) and generous amount of RAM. The position of the front facing camera is unfortunately as well which may make business video conferencing awkward as your interlocutors will see you bottom up. 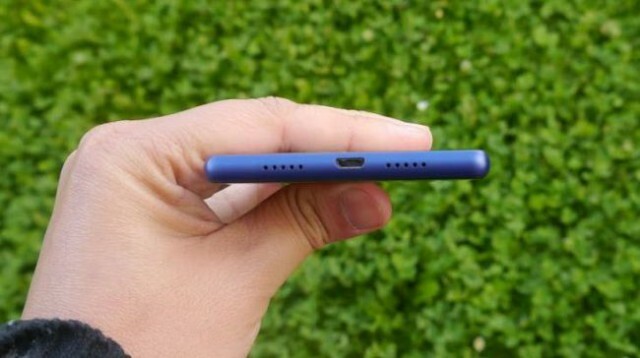 There’s no NFC, wireless charging or quick charging options sadly. 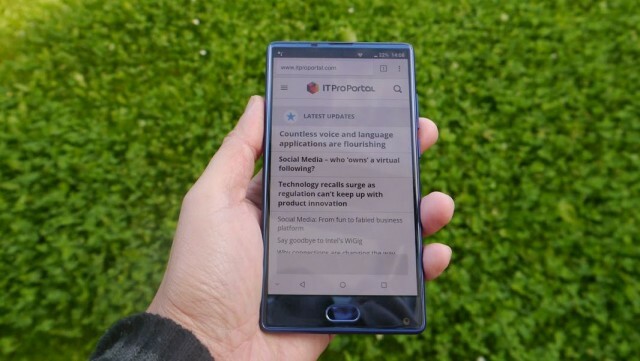 There’s a useful one-hand mode for those who feel the screen is too big and business users will get a free version of WPS Office, a competitor to Google Docs and Microsoft Office Mobile. 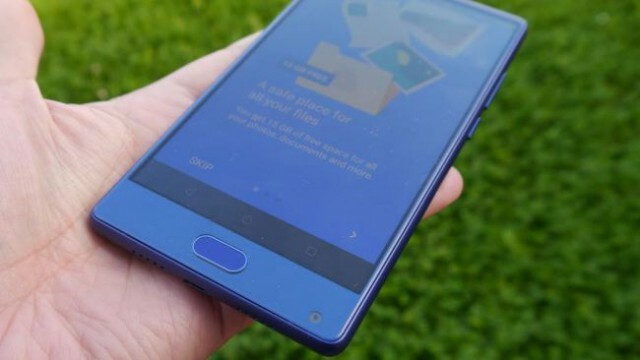 The Doogee Mix retails for around £140 (at DX.com), including shipping but excluding any potential local taxes and associated courier fees. You might want to get it from Amazon UK for £190 instead to avoid the hassle and within 24 hours (rather than a few weeks). As for the competition, there’s a plenty, although none of them have the swagger of the Mix. The UMIDigi Plus E (£189.99 at Amazon) which we reviewed recently has a full HD display but comes out worse on other accounts. The Vernee Mars Pro 4Gcomes with a full HD screen but has a single sensor camera at the back and a traditional thick-bezel design. It is also slightly more expensive at £147 at Gearbest. The nearest competitor to the Mix remains the MAZE Alpha which has the same bezel-less design, dual-sensor camera, 802.11ac, USB Type-C and a bigger battery. It is a tad bigger though -- thanks to a 6-inch display -- and at £162 is more expensive than the Doogee Mix. The Doogee Mix is a likable phone with jaw-dropping specs at a rock bottom price. If you can live with the name and some of its shortcomings (like the lack of NFC and its HD display), then it should be high on your list. Business people will the fingerprint reader and appreciate the shockingly good value for money. Shame that it doesn’t have a Guest mode like the Maze Blade 4G though and while we found Parallel Space in the apps list, we couldn’t get a link to it. A missed opportunity here.